The Evergreen Cemetery Gatehouse, erected in 1855, was one of the most prominent landmarks on East Cemetery Hill during the Battle of Gettysburg. By the time of the battle, approximately 390 people had been buried in Evergreen Cemetery. In 1856 400 trees were authorized to be planted in the cemetery. Its name was “Evergreen” Cemetery after all. Most of the trees were still quite small (as you can see by this photograph), did not survive, or had still not been planted by the time of the battle. 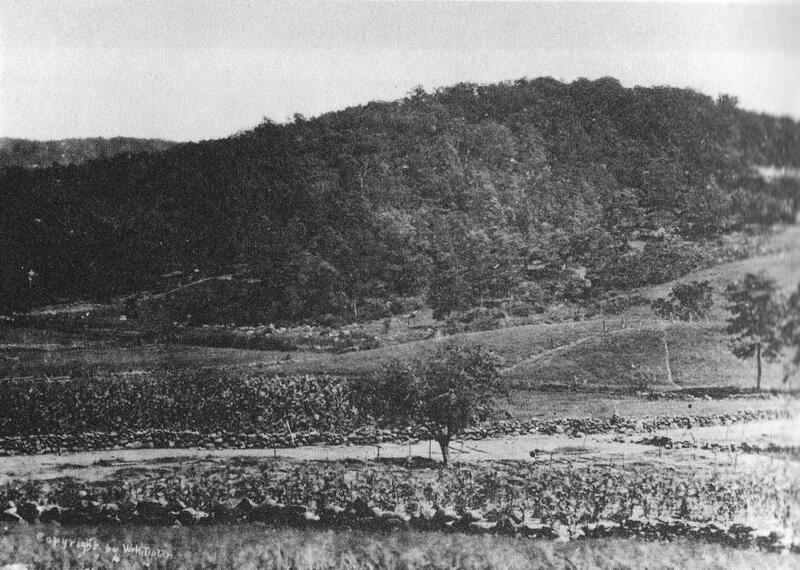 The earthworks/lunettes in the foreground were occupied by Lieutenant James Stewart’s Battery B, 4th United States Artillery. This view, by either Timothy O’Sullivan or Alexander Gardner, was taken facing south on Tuesday, July 7, 1863 and is courtesy of the New York Historical Society. Gettysburg Licensed Battlefield Guide Bobby Housch is a history teacher in a local public school district, and the editor of this website, the Gettysburg Daily. He grew up studying the “western theater” of the American Civil War. He also has more than a few relatives in the American Civil War, most of them from Georgia and Alabama. In today’s East Cemetery Hill post, Gettysburg Licensed Battlefield Guide Bobby Housch introduces himself, shows Cemetery Hill in relation to other pieces of “high ground,” and shows roads and other landmarks on East Cemetery Hill. To contact Licensed Battlefield Guide Bobby Housch, please click here to reveal his email address. 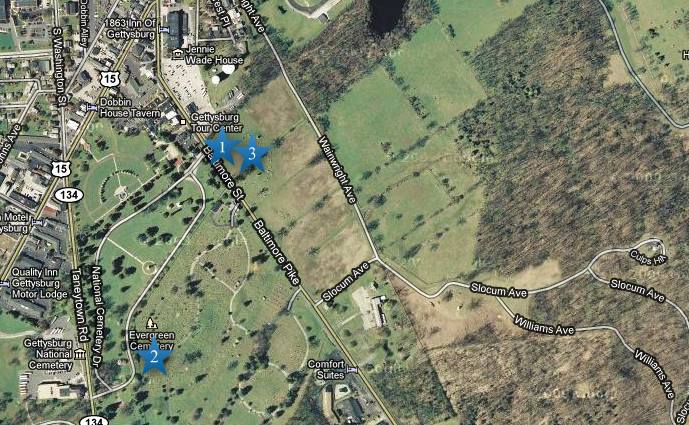 This map shows the location of the videos for the East Cemetery Hill posts. Video #1 was taken on East Cemetery Hill, north of the Evergreen Cemetery Gatehouse. Video #2 was taken in Evergreen Cemetery on the south slope of Cemetery Hill. Video #3 was taken on East Cemetery Hill covering an area beginning at Rickett’s Battery to the stone wall where the tulip poplar tree was located during the battle. This map was created facing north at approximately 12:00 PM on Sunday, December 26, 2010. Gettysburg Licensed Battlefield Guide Bobby Housch is the host for the East Cemetery Hill program. He is standing by the guns marking the position for Battery B, 4th United States Artillery. The Evergreen Cemetery Gatehouse is in the background. The Gatehouse was constructed in 1855. The darker bricks to the right (north) of the gatehouse is a post Civil War structure. This view was taken facing south at approximately 1:00 PM on Saturday, December 25, 2010. 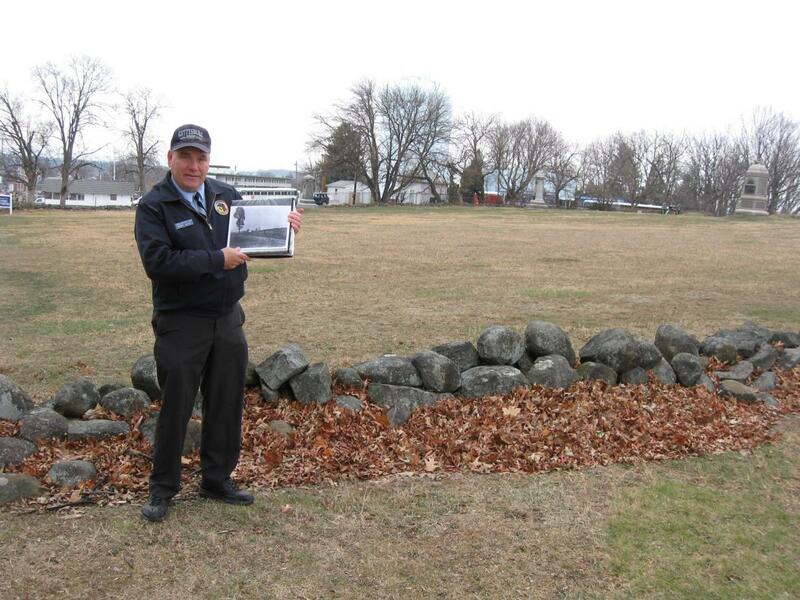 In Video #1 Gettysburg Licensed Battlefield Guide Bobby Housch is standing by artillery pieces marking the position of Stewart’s Battery B, 4th United States Artillery. He explains why high ground is important. This view was taken facing south to northwest to southeast at approximately 1:00 PM on Saturday, December 25, 2010. 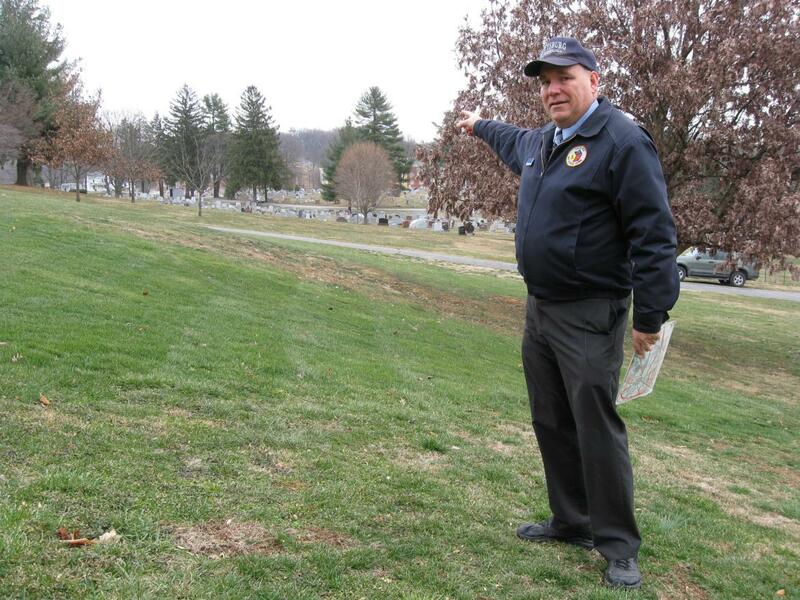 Licensed Battlefield Guide Bobby Housch is standing on the southeast slope of Cemetery Hill In Evergreen Cemetery. The Soldiers National Cemetery is on the other (west) side of the black fence. 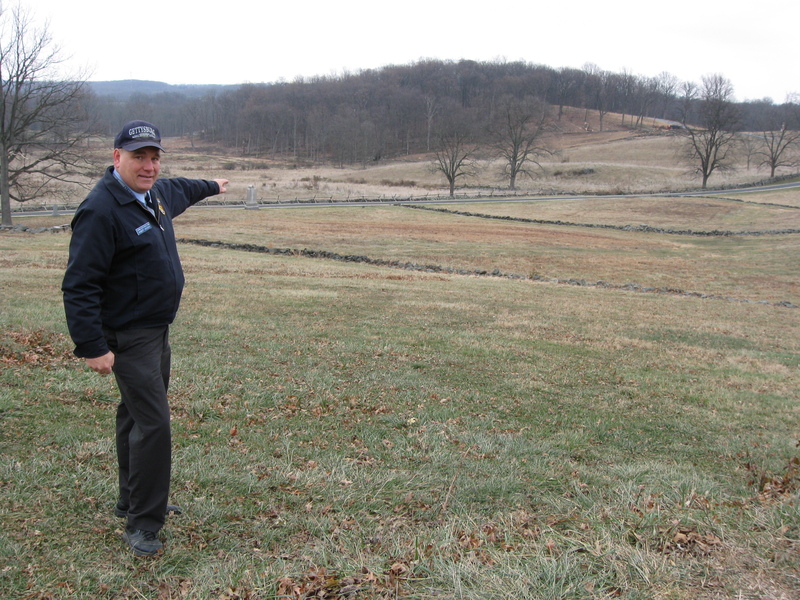 He is pointing towards Big Round Top, which is above and to the left of the light colored House on the Taneytown Road; Little Round Top is just to the left of Big Round Top; the light colored Pennsylvania State Monument which is to the right of the yellowish building sits on Cemetery Ridge. This view was taken facing southwest at approximately 1:00 PM on Saturday, December 25, 2010. In Video #2 Licensed Battlefield Guide Bobby Housch is standing on the southeast slope of Cemetery Hill in Evergreen Cemetery. He points out Cemetery Hill’s importance in relation to the rest of the Army of the Potomac’s position and how artillery on Cemetery Hill, while not completely controlling the road network leading into Gettysburg, will make it difficult for Confederates to freely move men, equipment and supplies on those roads. This view was taken facing south to southwest to northeast to south to west to north to west to northeast to west at approximately 1:00 PM on Saturday, December 25, 2010. Licensed Battlefield Guide Bobby Housch is still standing on the southeast slope of Cemetery Hill In Evergreen Cemetery. He is pointing towards Culp’s Hill. The Culp’s Hill observation tower is visible between two “evergreen” trees. The Baltimore Pike runs from right to left between Cemetery Hill and Culp’s Hill by the buildings visible in the left background. This view was taken facing east to northeast at approximately 1:00 PM on Saturday, December 25, 2010. This is Bobby’s map showing where he as colored in the roads to be brown and the high ground to be orange. The map was then laminated, and Bobby uses his blue and red “dry erase markers” to show troop movements on the map. The map is oriented facing west. This map was scanned at approximately 5:00 PM on Saturday, December 25, 2010. Bobby Housch is standing on the southeast slope of East Cemetery Hill and is pointing to the Baltimore Pike. On the far left is the Gettysburg Battlefield Museum. The white and gray stone structure above Bobby’s hand is the McKnight House. Above the McKnight House is Powers Hill. 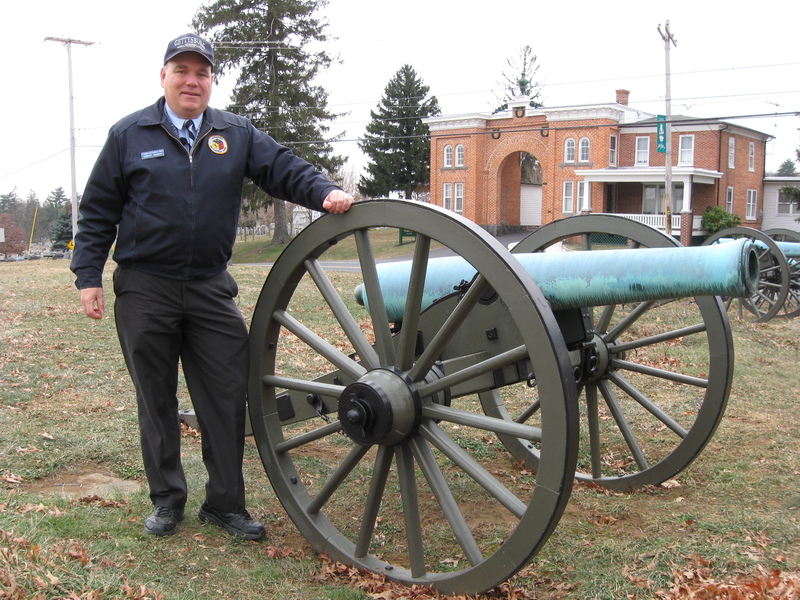 The cannon represent Battery L, first New York Artillery, which was commanded at Gettysburg by Lieutenant Gilbert H. Reynolds and Lieutenant George Breck. Above the cannon and to the right of the Baltimore Pike is the Comfort Inn. Bordering the Comfort Inn is Evergreen Cemetery. The small gray monument in the foreground is the right flank marker to the 4th Ohio Infantry Regiment. This view was taken facing southeast at approximately 1:00 PM on Saturday, December 25, 2010. In Video #3 Bobby Housch begins by standing on the southeast slope of East Cemetery Hill. 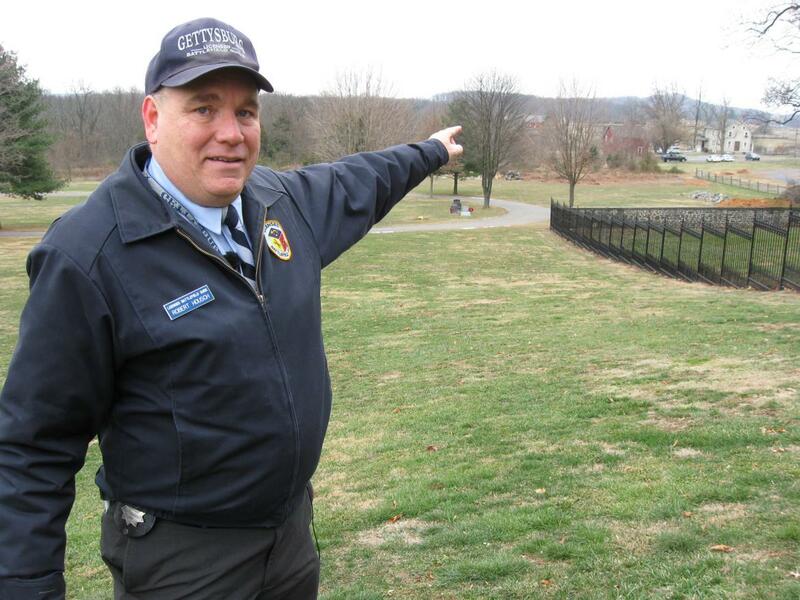 He points out landmarks such as the Baltimore Pike, Brickyard Lane (part of which becomes Wainwright Avenue), the location of the Tulip Poplar Tree, the light green-blue water tank, and the Evergreen Cemetery Gatehouse. This view was taken facing south to southeast to north to northwest to south at approximately 1:00 PM on Saturday, December 25, 2010. 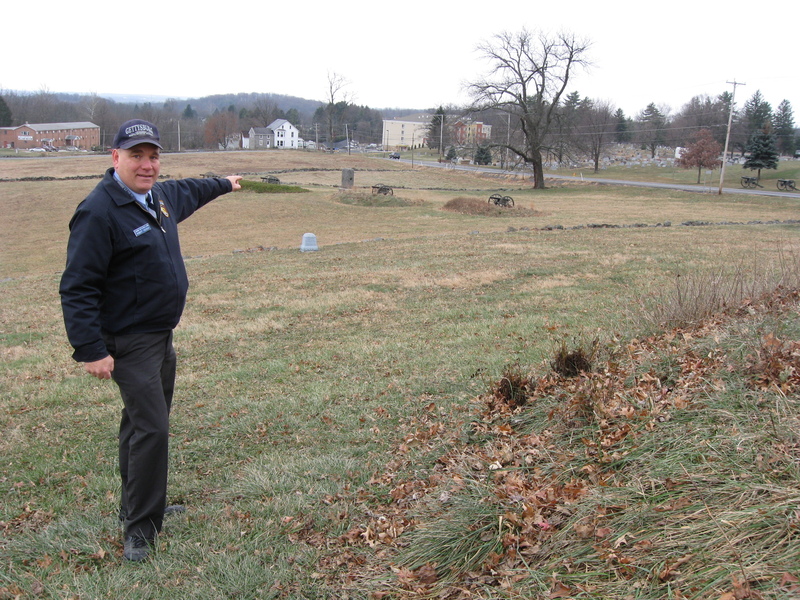 Bobby Housch is standing on the southeast slope of East Cemetery Hill and is pointing to the location of Brickyard Lane. The monument just to the right of Bobby’s hand is to the 41st New York Infantry Regiment. Modern Wainwright Avenue runs from right to left. On the other (east) side of the stone wall which borders the east side of Wainwright Avenue was Brickyard Lane. Culp’s Hill looms prominently in the background. In the right background is part of McKnight’s Hill/Stevens’ Knoll. 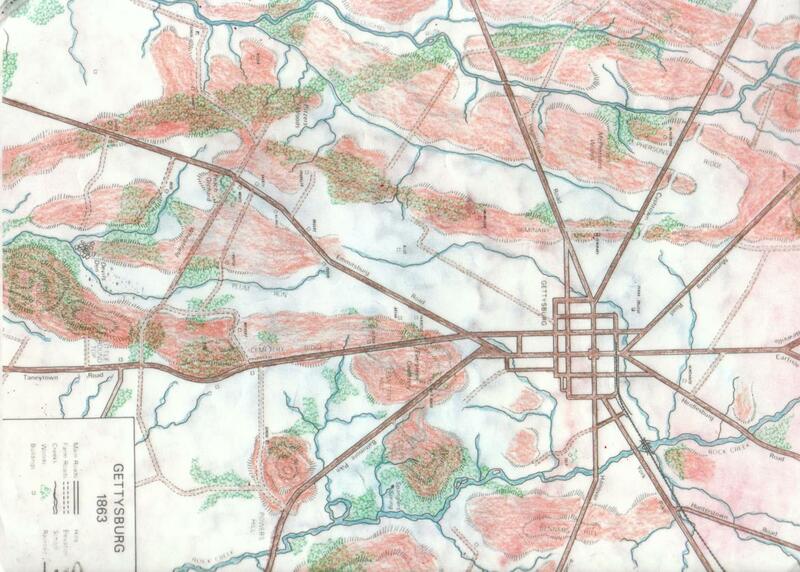 The 1860 Gettysburg tax records show that Peter Raffenseperger, who along with Edward Menchey owned Cemetery Hill, had many small parcels of land that he would rent. Some of these parcels are easily distinguished in this area by the stone walls marking the boundaries of the parcels. This view was taken facing southeast at approximately 1:00 PM on Saturday, December 25, 2010. 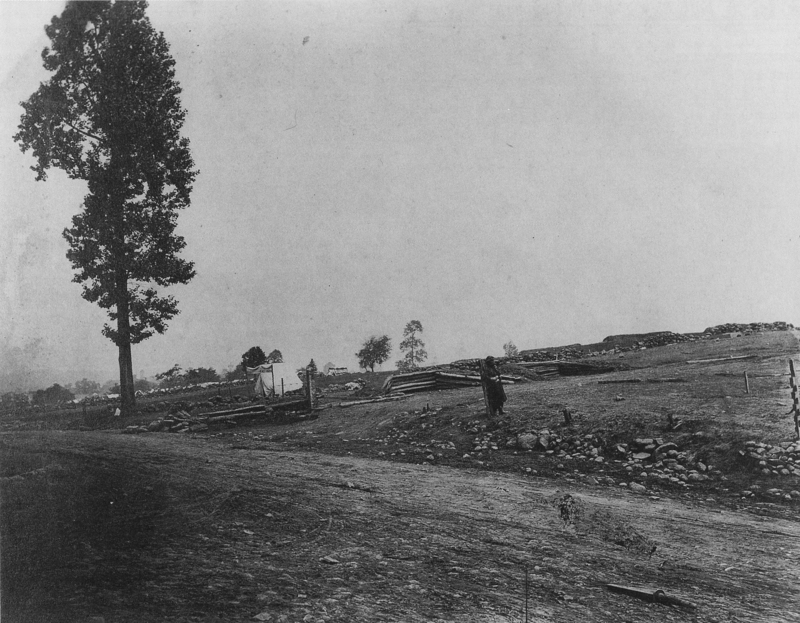 This picture of Culp’s Hill from East Cemetery Hill shows Brickyard Lane running from right to left at the bottom of the picture. By the time of the Civil War, Brickyard Lane was not only used by people with heavy loads trying to avoid climbing Cemetery Hill, it was also probably used by locals to have access to the plots of land they were renting. This view by the Tyson Brothers was taken facing southeast in August, 1863 and is courtesy of the National Park Service. 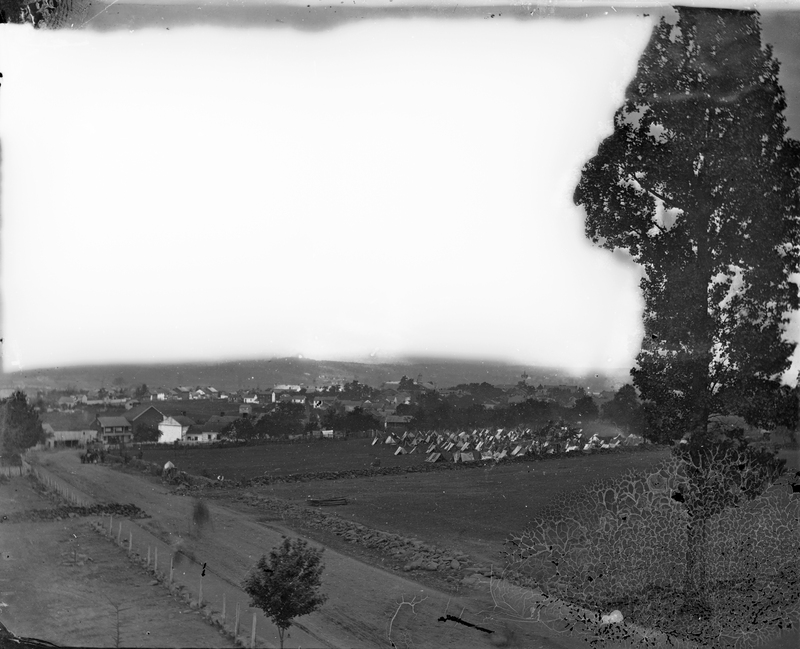 This photograph taken on top of the Evergreen Cemetery Gatehouse shows the town of Gettysburg in the background, and the tents of a military encampment where busses from the Gettysburg Tour Center are now parked. The Baltimore Pike in the foreground shows a stone wall on the other (east) side of the pike, and the remains of a post and rail fence on the left (west) side of the pike. On the right is one of the prominent landmarks for East Cemetery Hill during the battle, the Tulip Poplar Tree. This view by James Gibson was taken facing north in July, 1863 and is courtesy of the Library of Congress. Bobby Housch is standing on East Cemetery Hill near the location where the landmark Tulip Poplar Tree was located as shown in the picture that he is holding. The Tulip Poplar Tree was damaged by a lightning strike in 1876 and had to be taken down in 1886. More than a few Licensed Battlefield Guides now use the light green/blue water tank in the background behind the trees as a Cemetery Hill landmark. This view was taken facing north at approximately 1:00 PM on Saturday, December 25, 2010. This photograph by Philadelphia photographer Frederick Gutekunst shows the landmark Tulip Poplar Tree on the left of the stone wall. The Baltimore Pike is in the foreground. The Evergreen Cemetery Gatehouse is behind the photographer. The lunettes were at the position of Stewart’s Battery B, 4th United States Artillery. The person standing in the right foreground is Marie “French Mary” Tepe (1834-1901) a vivandiere from the 114th Pennsylvania Infantry Regiment (Collis’ Zouaves). This view, which appeared in Miller’s Photographic History of the Civil War was taken facing north between July 9-11, 1863.